A lawsuit filed in New York last year by a then-Vanguard Group Inc. tax attorney, and unsealed Friday in state court in Manhattan, alleges that Vanguard, the nation’s largest mutual fund company, has wrongly avoided paying federal and state income taxes since its creation in the 1970s. Vanguard “has operated as an illegal tax shelter for nearly 40 years, providing services to [its] funds at prices designed to avoid federal and state income tax, sheltering hundreds of millions of dollars of income annually, avoiding approximately $1 billion of U.S. federal income tax and at least $20 million of New York tax over the last 10 years,” alleges the lawsuit, which was filed by David Danon of Wayne before he was terminated by Vanguard in 2013. John S. Woerth, a spokesman for Malvern-based Vanguard, reacted to the lawsuit in a statement saying, “We generally do not comment on pending litigation, but we believe it is important to emphasize that Vanguard adheres to the highest ethical standards in every aspect of our business. Efforts to contact John Bogle, Vanguard’s founder, for reaction to the allegations were unsuccessful. 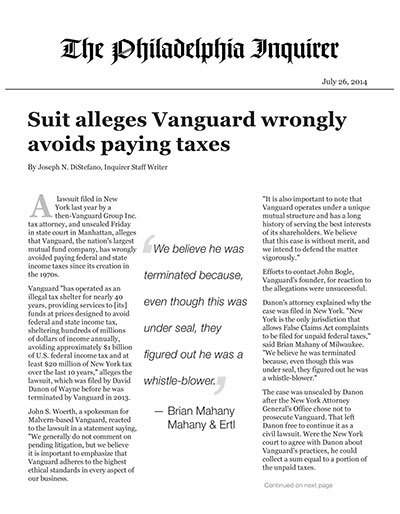 The case was unsealed by Danon after the New York Attorney General’s Office chose not to prosecute Vanguard. That left Danon free to continue it as a civil lawsuit. Were the New York court to agree with Danon about Vanguard’s practices, he could collect a sum equal to a portion of the unpaid taxes. Danon said other Vanguard principals who disagreed with the company’s tax position had also left Vanguard. Section 482 of the Internal Revenue Code, and most state’s laws, require that transactions between related companies take place at the same price as if the companies were unrelated. This is illegal for the same reason rich people are not allowed to sell property to their children at artificially low prices to avoid inheritance taxes, the lawsuit says. It is a “bedrock tax principle” and what lawyers call “black-letter law,” generally accepted by lawyers and courts, the suit adds.